While mental strength is perhaps the most important, physical strength is an undeniable advantage. Our karate and taekwondo lessons help kids to develop bodily strength as well as teaching them how best to apply it. While our Alpharetta instructors do not encourage kids to instigate fights, we teach our students valuable self-defense skills. Simple and minimally violent moves, like a well-placed hand or foot, can demonstrate physical prowess and deter many potentially violent confrontations. Bullying is a real problem for many kids, whether your child has become the victim or is showing a tendency to bully others. Both sides of the issue can be addressed in karate. 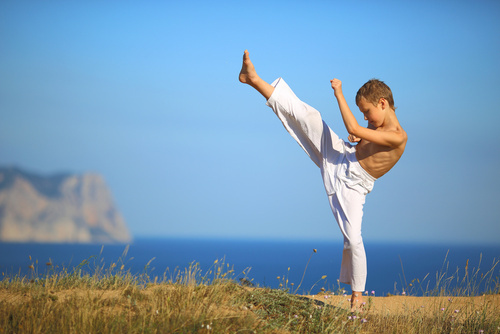 For the victim, the mental and physical strength that comes with learning karate will arm kids to be assertive and confident where they might otherwise become a victim to an escalating cycle of bullying that often includes peer violence.Similarly, kids who tend to bully may do so because they are facing their own insecurities. Karate lessons can teach these kids how to be assured of their own worth and value without the need to put others down. While somewhat less frequent, criminal abduction against children is also a problem in society, in Georgia and throughout the country. Unfortunately, parents cannot always be present to prevent these dangerous situations. The best defense is to teach the children how to help themselves.Our karate instructors are passionate about teaching kids awareness of their surroundings, including strangers and suspicious activity. We teach these vulnerable children how to be self-assured and calm in these situations, relying mostly upon their mental strength to get themselves out of danger. If necessary, self-defense skills can also become a powerful deterrent to strangers who expect kids to be docile, passive, and completely oblivious to their own danger. While we all hope these situations never occur with our own kids, we can all rest much easier knowing that these kids are equipped to avoid and escape these dangers.You can change your child’s life by giving them the gifts of confidence, self-assurance, self-defense, and physical and mental strength by signing up for karate lessons.